Oh and yes...these too have that signature red bottom and yes it's a sick addiction! 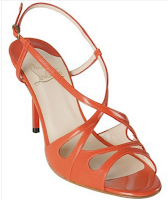 The perfect orange strapy summer shoe! ~Sorry these shoes are no longer available.